From bank to burgers. This building, with its mid-century accordion-style roof, has seen a few changes in its day. Originally built as The Colorado Federal Savings bank, it is located at 200 16th Street in Denver, Colorado. The building was designed by architect William Muchow. 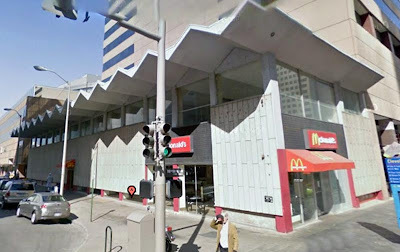 The interior of the building was substantially altered to be used as a McDonalds after the bank ceased operation. An article in Architectural Record noted that William Muchow Associates of Denver designed the building to contrast with its merchant neighbors by including large expanses of masonry without windows. The building, which featured quartz terrazzo exterior panels, also integrated function and aesthetics with economic considerations. The concrete folded-plate roof provided a less costly way to span the interior without columns. The building is on the National Register of Historic Places. A souvenir replica coin bank of this building was manufactured in 1958 by Banthrico. They are made of copper-toned pot metal and measure 6-3/8" x 3-3/8" and 2-3/8" tall. I wrote about this souvenir figural building coin bank before and its distinctive roof.